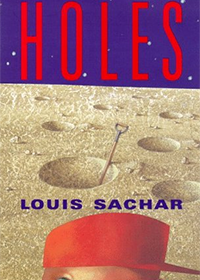 Holes by Louis Sachar and is a story about Stanley Yelnats IV, who found himself in the wrong place at the wrong time. Stanley’s dad is an inventor. He is trying to find the solution for foot odor. Stanley was walking home on the last day of school when something fell out of the sky and hit him on his head. He was unaware that the object was a famous baseball player’s cleats. As he ran back to his house, he was stopped and arrested by the police for stealing the cleats. He was sentenced to 18 months at Camp Green Lake. At Camp Green Lake the warden makes inmates dig a 5 foot by 5 foot hole in order to build character. One day while digging Stanley finds the fossil of a fish. Later that day Stanley receives a note from his mom that says “ Your dad said he thinks he is close to finding out the solution of foot odor. The landlord he threatening to kick us out. I feel bad about the old lady who lives in a shoe, because it must of smelled really bad.” Afterwards Zero, another inmate, asks Stanley to teach him how to read. Zero is a homeless child who grew up in a park that Stanley went to a lot. Zero wants to leave the camp because he doesn’t like it there. Stanley wants Zero to stay with him so they can both do their time. He also offers Zero a chance to stay with his family after they leave camp. Even so, Zero does not seem convinced. Stanley fears that Zero may not stay at camp much longer. I like this book because it has a great story. It also tells what happens when you are in the wrong place at the wrong time. The writing in the book is great. It had short chapters and it had interesting vocab. It teach more about life.